Vox not only introduced the Tonelab ST in 2010, they also introduced Valvetronix VT Plus Series amplifiers. The VT Plus Series featured a redesigned effects and control section featuring three variations of eleven amp models, eleven effects pedals, eleven modulators and three types of reverb. The control panel for a VT Plus Series amp is shown below. A close comparison of the control panels of the Tonelab ST and the Valvetronix VT Plus Series will reveal that the effects and control sections of the Tonelab ST and VT Plus amps were virtually identical. 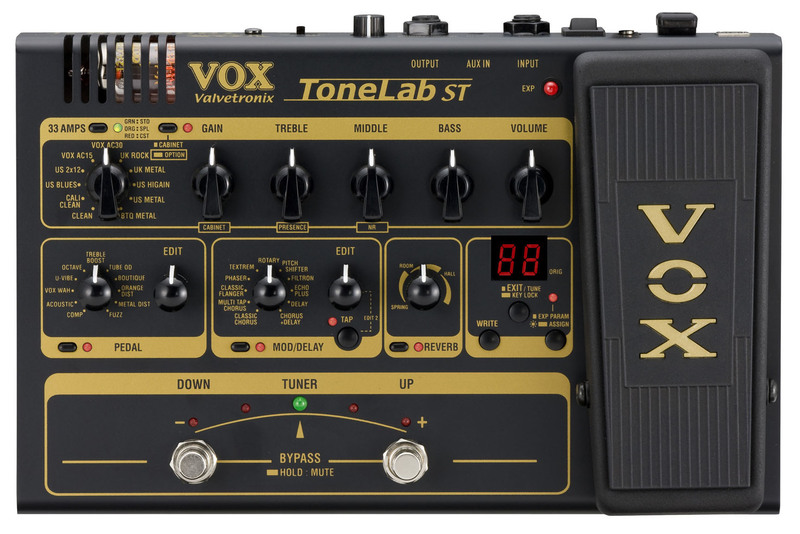 At an MSRP of only $275, the Tonelab ST was the least expensive Tonelab produced by Vox. Amp Models (11x3): Clean, Cali Clean, US Blues, US 2x12, Vox AC-15, Vox AC-30, UK Rock, UK Metal, US Higain, US Metal and BTQ Metal. Each amp model offers three variations: Standard (Green LED), Special (Orange LED) and Custom (Red LED). Dimensions and Weight: ~10.6" x ~7.1" x ~2.75" ~3.5 pounds.